"We're just about ready to set sail. I don't know about you, but the moonlet is looking a little too close for comfort these days." "I don't like the way the mountain rumbles these days. Makes me glad we're about to set sail and leave all this disaster behind us." "By the Three, I've never seen the mountain so active. And Baar Dau! I swear, the moonlet looks like it's about to fall from the sky! I can't wait to set sail and put dry ground behind me." Asking her to take you somewhere else on Vvardenfell: "We're headed to Sadrith Mora, if that's where you'd like to go. Just decide quick. I want to sail on the next tide." 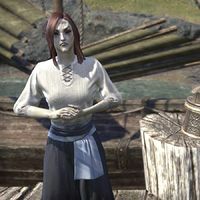 If you tell her you want to go somewhere outside Vvardenfell, she'll agree it's a good choice: "I was planning on sailing to Sadrith Mora next, but I don't mind taking you to an Alliance capital. Trade is always good in the capitals!" This page was last modified on 7 January 2018, at 20:28.